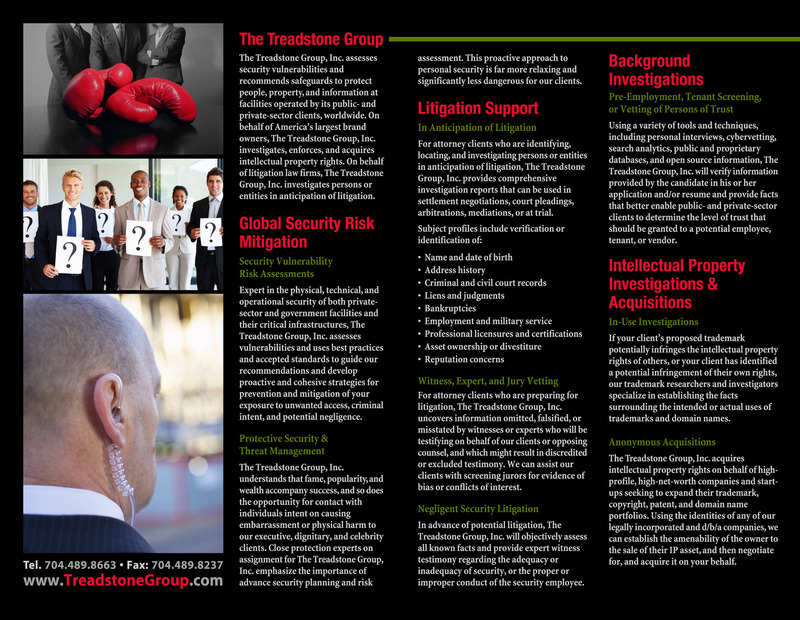 The Treadstone Group, Inc. understands and works effectively with the concepts of threat, risk, and impact to significantly assist in the determination of vulnerability and how it can be effectively reduced. The Treadstone Group, Inc. is a leading authority on counterterrorism; vulnerability, risk, and threat assessment; and the physical and operational security of targeted facilities, critical infrastructures, and National Special Security Events (NSSEs) worldwide. Our experts, who have decades of pertinent and practical experience, assess vulnerabilities and use best practices and accepted standards to guide our recommendations and develop proactive and cohesive strategies for the prevention and mitigation of exposure to unwanted access, criminal intent, and potential negligence at facilities owned or occupied by multinational corporations; high-profile, high-net-worth business, civic, and religious leaders; and domestic and friendly foreign government agencies. The Treadstone Group, Inc. understands that fame, popularity, and wealth accompany success, and so does the opportunity for contact with individuals intent on causing embarrassment or physical harm to our executive, dignitary, and celebrity clients. The cornerstone of our success is the focus on prediction, prevention, and mitigation. We emphasize the importance of advance security planning and risk assessment, enabling us to provide a proactive approach to personal security, which, in turn, is far more relaxing and significantly less dangerous for our clients. The Treadstone Group, Inc. only employs professionals having demonstrable, verifiable, and practical experience protecting the nation’s highest elected leaders and other government officials, diplomats, dignitaries, or executives. Protective research is an integral component of all security operations. The criticality of protective intelligence (assessing threats and prioritizing indicators) and meticulous security advances (site and route analyses) as a the primary means to mitigate risks to our clients from persons and groups with the intention and capacity to gain lethal access is the core component of our success. Actionable intelligence generated through our research better enables our Close Protection Teams to implement tactics, techniques, and procedures to deter or stop inappropriate approach by others intent on causing embarrassment or physical harm to our clients. In advance of potential litigation, The Treadstone Group, Inc. will objectively assess all known facts and provide expert witness testimony regarding the adequacy or inadequacy of security, or the proper or improper conduct of the security employee.